This Chess set is called color chess set. In the picture above, you can see about its different color with ordinary chess set that commonly use in champion or in any chess game event. The ordinary chess set is brown and black, supported with its chess board. But to increase the interesting feeling of chess in kids world, we try to make some different chess pieces. This color chess pieces in a variety of fun colors. You can use it to teach children the basics of chess in a fun way. A beautiful unique set and eye catching. Children love this kind of chess set. It made of Teak wood and painted in fun colors, so that children can enjoy their game without worry about the damage. 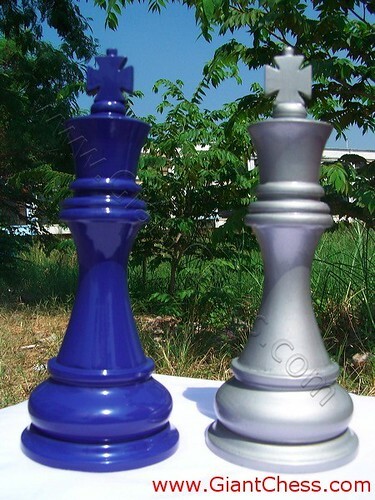 Here we present wood chess set that painted in blue and silver. Chess set included: 1 King, 1 Queen, 2 Knights, 2 Rooks, 2 Bishops, 8 Pawns. It would be so attractive if the chess pieces are presented in giant size. Not only for outdoor chess, but you can also use it for house decoration. Perfect to decorate your indoor and outdoor space in your house.